The Redskins have played more than one thousand games since their founding 87 years ago in 1932, and are one of only five franchises in the NFL to record over six hundred regular season and postseason wins, reaching that mark in 2015. The Redskins have won five NFL Championships (the latter three in Super Bowls), and have captured fourteen divisional titles and six conference championships. It was the first NFL franchise with an official marching band and the first with a fight song, Hail to the Redskins. The team began play in Boston as the Braves in 1932, and became the "Redskins" the following year. In 1937, the team relocated to Washington, D.C., where they have been based since. The Redskins won the 1937 and 1942 NFL championship games, as well as Super Bowls XVII, XXII, and XXVI. They have been league runner-up six times, losing the 1936, 1940, 1943, and 1945 title games, and Super Bowls VII and XVIII. With 24 postseason appearances, the Redskins have an overall postseason record of 23–18. Their three Super Bowl wins are tied with the Oakland Raiders and Denver Broncos, behind the Pittsburgh Steelers and New England Patriots (six each), San Francisco 49ers and Dallas Cowboys (five each), and the Green Bay Packers and New York Giants (four each). All of the Redskins' league titles were attained during two 10-year spans. From 1936 to 1945, the Redskins went to the NFL Championship six times, winning two of them. The second period lasted between 1982 and 1991 where the Redskins appeared in the postseason seven times, captured four Conference titles, and won three Super Bowls out of four appearances. The Redskins have also experienced failure in their history. The most notable period of general failure was from 1946 to 1970, during which the Redskins posted only four winning seasons and did not have a single postseason appearance. During this period, the Redskins went without a single winning season during the years 1956–1968. In 1961, the franchise posted their worst regular season record with a 1–12–1 showing. Since their last Super Bowl victory following the end of the 1991 season, the Redskins have only won the NFC East three times, made five postseason appearances, and had nine seasons with a winning record. According to Forbes, the Redskins are the fourth most valuable franchise in the NFL and the tenth most valuable overall in the world as of 2018, valued at approximately US$3.1 billion. They also set the NFL record for single-season attendance in 2007, and have the top ten single-season attendance totals in the NFL. Over the team's history, the name and logo have drawn controversy, with many criticizing it as offensive to Native Americans. The team originated as the Boston Braves, based in Boston, Massachusetts, in 1932, under the ownership of George Preston Marshall. At the time the team played in Braves Field, home of the Boston Braves baseball team in the National League. The following year, the club moved to Fenway Park, home of the American League's Boston Red Sox, whereupon owners changed the team's name to "Boston Redskins." To round out the change, Marshall hired William "Lone Star" Dietz, who was thought to be part Sioux, as the team's head coach. However, Boston wasn't much of a football town at the time and the team had difficulty drawing fans. The Redskins relocated south from New England after five years to the national capital of Washington, D.C. in 1937. Through 1960, the Redskins shared baseball's Griffith Stadium with the first Washington Senators baseball team of the American League. In their first game in Washington on September 16, the Redskins defeated the New York Giants in the season opener, 13–3. On December 5, they earned their first division title in Washington with a 49–14 win over the Giants in New York, for the Eastern Championship. The next week on December 12, the team won their first league championship, over the Chicago Bears. In 1940, the Redskins met the Bears again in the championship game on December 8. The result, 73–0 in favor of the Bears, is still the worst one-sided loss in NFL history. The other big loss for the Redskins that season occurred in September during the coin toss prior to the Giants game. After calling the coin toss and shaking hands with the opposing team captain, lineman Turk Edwards attempted to pivot around to head back to his sideline. However, his cleats caught in the grass and his knee gave way, injuring him and bringing his season and hall of fame career to an unusual end. In what became an early rivalry in the NFL, the Redskins and Bears met two more times in the NFL Championship Game. The third time in 1942 on December 13, where the Redskins won their second championship, 14–6. The final time the two met was the 1943 on December 26, which the Bears won 41–21. The most notable accomplishment achieved during the Redskins' 1943 season was Sammy Baugh leading the NFL in passing, punting, and interceptions. In 1961, the Redskins moved into their new stadium called D.C. Stadium (changed to Robert F. Kennedy Memorial Stadium in 1969). The first game in new D.C. Stadium occurred on October 1 in front of 37,767 fans. However, the Redskins failed to hold a fourteen-point lead and lost to the New York Giants 24–21. That same year, Bill McPeak became the head coach and had a record of 21–46–3 over five seasons. During his tenure, he helped draft future stars: wide receiver Charley Taylor, tight end Jerry Smith, safety Paul Krause, center Len Hauss, and linebacker Chris Hanburger. He also helped pull off two important trades, gaining quarterback Sonny Jurgensen from the Philadelphia Eagles and linebacker Sam Huff from the New York Giants. One reason for the team's struggles was disarray in the front office. Marshall began a mental decline in 1962, and the team's other stockholders found it difficult to make decisions without their boss. Marshall died on August 9, 1969, and Edward Bennett Williams, a minority stockholder who was a Washington resident and one of America's most esteemed attorneys, was chosen to run the franchise while the majority stockholder, Jack Kent Cooke, lived on the West Coast in Los Angeles and ran his basketball team, the Los Angeles Lakers. In 1966, Otto Graham was hired as the new head coach. 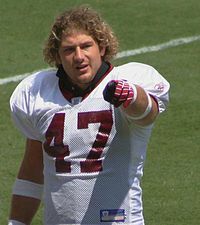 Graham coached the Redskins for three seasons, but whatever magic he had as an NFL player disappeared on the sidelines as the team recorded a mark of 17–22–3 during that time period. He resigned after the 1968 season in favor of Vince Lombardi, and became athletic director of the Coast Guard Academy before retiring at the end of 1984. In 1969, the Redskins hired Vince Lombardi—who gained fame coaching with the Green Bay Packers—to be their new head coach. Lombardi led the team to a 7–5–2 record, their best since 1955, but died of cancer on the eve of the 1970 season. Assistant coach Bill Austin was the interim head coach in 1970, and Washington finished at 6–8. In 1962, Washington became the final professional American football franchise to integrate. First, the Redskins drafted running back Ernie Davis of Syracuse, the first black player to win the Heisman Trophy. They also took fullback Ron Hatcher in the eighth round, a player from Michigan State who became the first black to sign a contract with the team. But, in mid-December 1961, Marshall announced that on the day of the NFL draft he had traded the rights to Davis to the Cleveland Browns, who wanted Davis to join the league's leading rusher, Jim Brown, in their backfield. Davis was traded to the Browns for running back Bobby Mitchell (who became a wide receiver in Washington) and 1962 first-round draft choice Leroy Jackson. The move was made under unfortunate circumstances – as it turned out that Davis had leukemia, and died without ever playing a down in professional football. The Redskins ended the 1962 season with their best record in five years: 5–7–2. Mitchell led the league with 11 touchdowns, and caught 72 passes and was selected to the Pro Bowl. In time, Mitchell would be joined by black stars like receiver Charley Taylor, running back Larry Brown, defensive back Brig Owens, and guard John Nisby from the Pittsburgh Steelers. Then U.S. President Richard Nixon meeting with the Redskins, November 23, 1971. The Redskins again made the playoffs in 1973, 1974, and 1976, only to lose all three times in the first round. After his Redskins failed to make the playoffs in 1977 despite posting a 9–5 record, Allen was fired and was replaced by new head coach Jack Pardee, a star linebacker under Allen in Los Angeles and Washington. In his first year, his team started 6–0 but then lost 8 of the last 10 games. Then in the offseason, Redskins majority owner Jack Kent Cooke moved from Los Angeles to Virginia and took over the team's day-by-day operations from Edward Bennett Williams. In January 1983, during the second round of the playoffs against the Minnesota Vikings, John Riggins rushed for a Redskins playoff record 185 yards, leading Washington to a 21–7 win. The game is perhaps best known for a moment when the stadium physically shook as a crowd chanted "We Want Dallas! ", which later became a rallying cry of sorts for Redskin fans before games against the Cowboys. 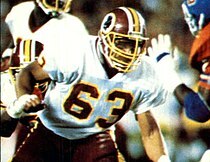 In the NFC Championship Game against them at Robert F. Kennedy Memorial Stadium, Redskins defensive end Dexter Manley knocked Cowboys' quarterback Danny White out for the rest of the game and sent him into the locker room shortly before halftime. Later in the game, Redskins defensive tackle Darryl Grant's interception which he returned for a 10-yard touchdown off one of Cowboys' backup quarterback Gary Hogeboom's passes which was tipped by Dexter Manley to score the decisive points. John Riggins rushed for 140 yards and two touchdowns on 36 carries and the Redskins went on to defeat the Cowboys' by a score of 31–17. The Redskins' first Super Bowl win, and their first NFL Championship in 40 years, was in Super Bowl XVII, where the Redskins defeated the Miami Dolphins 27–17. Riggins provided the game's signature play when, on 4th and inches, with the Redskins down 17–13, the coaches called "70 Chip", a play designed for short yardage. Riggins instead gained 43 yards (39 m) by running through would-be tackler Don McNeal and getting the go-ahead touchdown. The Redskins ended up winning by a 27–17 score with John Riggins winning the Super Bowl MVP. The 1983 season marked the rookie debut of cornerback Darrell Green, selected in the 1983 NFL Draft along with Charles Mann, Green would go on to play his entire 20-year NFL career for the Redskins. On October 1, 1983, the Redskins lost to the Green Bay Packers 48–47 in the highest scoring Monday night football game in history, in which both teams combine for more than 1,000 yards (910 m) of total offense. Then during the regular-season finale on December 17, 1983, Moseley set an NFL scoring record with 161 points while Riggins' total of 144 points was second. This marked the first time since 1951 that the top two scorers in a season played on the same team. They dominated the NFL with a 14-win season which included scoring a then NFL record 541 points, many of which came from Riggins, who scored 24 touchdowns. Redskins quarterback Joe Theismann would also be named the 1983 NFL's Most Valuable Player finishing the season with a career-high in both yards passing 3,714 yds., and touchdown passes thrown, 29 Td's while throwing only 11 interceptions. In the postseason, the Redskins beat the Los Angeles Rams 51–7. The next week, Washington beat the San Francisco 49ers 24–21 in the NFC Championship Game. It was their final win of the season because two weeks later, the Raiders beat the Redskins 38–9 in Super Bowl XVIII. The Redskins defeated the Vikings in the 1987-88 NFC Championship Game (left) and went on to top the Broncos in Super Bowl XXII (right), winning their second Super Bowl ring. The 1987 season began with a 24-day players' strike, reducing the 16-game season to 15. The games for weeks 4–6 were won with all replacement players. The Redskins have the distinction of being the only team with no players crossing the picket line. Those three victories are often cred with getting the team into the playoffs and the basis for the 2000 movie The Replacements. The Redskins won their second championship in Super Bowl XXII on January 31, 1988, in San Diego, California. The Redskins routed the Denver Broncos 42–10 after starting the game in a 10–0 deficit, the largest come-from-behind victory in Super Bowl history, which was tied by the New Orleans Saints in Super Bowl XLIV and the New England Patriots in Super Bowl XLIX. This game is more famous for the stellar performance by quarterback Doug Williams who passed for four touchdowns in the second quarter en route to becoming the first black quarterback to lead his team to a Super Bowl victory while also winning the games Super Bowl MVP award. Rookie running back Timmy Smith had a great performance as well, running for a Super Bowl record 204 yards (187 m). In Snyder's first season as owner, the Redskins went 10–6, including a four-game winning streak early in the season, and made it to the playoffs for the first time in Norv Turner's career (and the first time for the Redskins since 1992) in the final game of the season (on January 2, 2000 against the Dolphins). Running back Stephen Davis rushed for a then club-record 1,405 yards and quarterback Brad Johnson completed a then club-record 316 passes and threw for more than 4,000 yards in regular play that season. They then beat the Detroit Lions in the first round of the playoffs, but lost to the Buccaneers, 14–13. The season started about as well as it could have, as the Washington Redskins started the season 6–2, with their two losses coming by a combined 11 points to the New York Giants and St. Louis Rams. Furthermore, Redskins star Clinton Portis led the NFL in rushing yards and Jason Campbell was just 40 pass attempts away from breaking Bernie Kosar's record of consecutive passes to start the season without an interception. However, things turned for the worse on the eve of the 2008 Presidential Election, when they were routed 23–6 by the Pittsburgh Steelers and Clinton Portis' injuries finally caught up to him. The Redskins continued to struggle, falling all the way to 7–7, with their only win during that six-week period being a 3-point victory of the then-2–8 Seattle Seahawks, who would finish the season 4-12. The Redskins managed to upset the Philadelphia Eagles in Week 16, but were eliminated from playoff contention after the Atlanta Falcons defeated the Minnesota Vikings 24–17 that same week. The Redskins lost the final game of the season 27–24 to the San Francisco 49ers, despite having a 17–7 lead at halftime, losing on a Joe Nedney field goal as time expired. In Week 2, the team traveled to St. Louis where they lost 24-22. A major defensive loss was suffered when Brian Orakpo went down from a tear to his left pectoral muscle. Despite widespread complaints from Redskins fans and players about the Rams playing dirty, there was nothing to do but move on to the home opener against Cincinnati. The game started on a bad omen when the Bengals threw a 76-yard TD pass on the opening drive. Although the Redskins responded furiously and played another close match, they lost and injuries continued to pile up as CB Josh Wilson and WR Pierre Garçon went down. They would win their next game on a late game field goal at Tampa Bay, 24-22, after the Buccaneers made a 4th quarter comeback to take the lead. The Redskins only won one of their next five games, going into the bye week at 3-6. After winning the NFC East in the previous season, hopes were high for a repeat in 2013. However, these hopes were in vain, as poor play and controversy stirred during the entire year, leading to the disastrous record of 3–13. This was the worst record the Redskins have posted since 1994. Even though most players had a down year compared to last season, Pierre Garçon had his greatest season statistically yet. Garcon eventually broke Art Monk's 29-year-old franchise record for catches in a single season. Garcon had 113 catches total, which broke Monk's 106 catches in 1984 by seven. The team's offense in 2016 set several franchise records, including having over 6,000 total net yards, which was only the third time in franchise history the team had accomplished that. Quarterback Kirk Cousins also set single-season team records in attempts, completions, and passing yards, breaking many of his records he had previously set in 2015. DeSean Jackson, Pierre Garçon, Jamison Crowder, Robert Kelley, Chris Thompson, Jordan Reed, Vernon Davis, and Matt Jones all finished the season with at least 500 yards from scrimmage, tying the 2011 New Orleans Saints for the most in a single season in NFL history. Despite the numerous records set, the Redskins missed the playoffs, losing 19–10 in a "win and in" situation against the New York Giants in the final week of the season. However, the Redskins still finished the season with a record of 8–7–1, giving the team their first consecutive winning seasons in nearly 20 years. In contrast with the record setting offense, the team's defense had a poor season, finishing 29 out of 32 teams in total defense, which led to the firing of defensive coordinator Joe Barry, as well as three of his assistants. 2017 was the team's 85th season. Kirk Cousins had his third straight season with 4,000 passing yards while once again playing under the franchise tag. For the fifth straight season, the Redskins missed the playoffs, finishing 7-9. It was also the last season that Cousins was seen in a Redskins uniform before joining the Minnesota Vikings following the season, ending his 6-year tenure with the Redskins. From 1981–2009, their burgundy jerseys were primarily used when the opposing team decided to wear white at home, which comes mostly against the Dallas Cowboys and occasionally the Philadelphia Eagles, and was normally worn over white pants. It was worn on the road against other teams that like to wear white at home for games occurring early in the season. 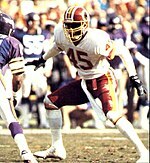 From 1981 through 2000, the Redskins wore their white jerseys over burgundy pants at home almost exclusively. In 1994, as part of a league-wide celebration of the NFL's 75th Anniversary, during certain games the Redskins wore special uniforms which emulated the uniforms worn by the team in its inaugural season as the Washington Redskins, 1937. Both worn over gold pants, the burgundy jerseys featured gold numbers bordered in white and the white jerseys featured burgundy numbers bordered in gold. The most distinctive feature of both colors of the jersey was the patches worn on both sleeves, which were a reproduction of the patches worn on the full-length sleeves of the 1937 jerseys. Worn with these uniforms was a plain burgundy helmet with a gold facemask. 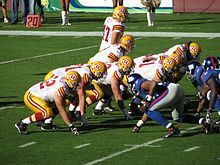 In 2001, the Redskins wore burgundy for all home games in the preseason and regular season per a decision by Marty Schottenheimer, their coach for that year. In 2002, the team celebrated the passing of 70 years since its creation as the Boston Braves in 1932, and wore a special home uniform of burgundy jersey over gold pants which roughly resembled the home uniforms used from 1969–1978. The helmets used with this special home uniform during that year were a reproduction of the helmets used by the team from 1965–69, though they wore white at home in Week 1 against the Arizona Cardinals and again in Week 17, the latter forcing the Cowboys to use their blue jerseys. This special home uniform was also worn during one game in 2003. In 2004, when Joe Gibbs became the coach of the Redskins once again, the team switched back to wearing white jerseys at home; in Gibbs's 16 years as head coach, the team never wore burgundy jerseys at home, even wearing a white throwback jersey in 2007. In a Monday Night Football game against the against the Pittsburgh Steelers in 2008, the Redskins wore a monochrome look by wearing burgundy jerseys over burgundy pants. This combination made two further appearances the following season against the Dallas Cowboys and New York Giants. The team, starting in the 2010 season, would begin to wear the burgundy jersey paired with the throwback style of gold pants, reminiscent of the George Allen era, after wearing white jerseys at home almost exclusively from the 1980s and to the 2000s. Against the Tennessee Titans later that season, the team matched the gold pants with the usual white jerseys for the first time. The same combination would be worn at the Giants two weeks later. In 2011, they would wear the burgundy jersey/gold pants look for five home games and a road game at Dallas, the burgundy jersey/white pants look for three home games and a road game at Miami, the white jersey/burgundy pants look for five road games, and the white jersey/gold pants look for a Bills game in Toronto. The following year, the team would wear an updated throwback uniform of the 1937 team - notable for a helmet which, rather than being blank or including team insignia, featured a pattern intended to invoke the simple leather helmets worn at the time - in a game against the Carolina Panthers, in honor of the team's first championship season. In 2013, a newly implemented NFL rule stated that teams could not wear alternate helmets on account of player safety. Due to that, the Redskins would wear the 1937 throwbacks with the sticker removed from the regular helmet in a game versus the San Diego Chargers. That year would also see the team remove its burgundy collar from their white jersey, in order to have better consistency with the new Nike uniforms that debuted the previous season. For 2014, the team dropped their white pants and for the next two seasons wore the gold pants full-time with their standard uniforms, although the burgundy pants returned as part of the team's away uniform starting in 2016. In 2017, the Redskins resurrected the all-burgundy ensemble as part of the NFL Color Rush. Initially, Nike gave the Redskins an all-gold uniform for the Color Rush program, but the team refused to wear it suggesting that the look was garish. Instead, the Redskins wore burgundy uniforms, pants, socks and cleats for the game against the Cowboys that November. For 2018, the Redskins replaced the gold pants with white pants. The name and logo of the Washington Redskins is part of a larger controversy regarding the use of Native American names, images and symbols by non-native sports teams, but receives the most public attention due to the prominence of the team being located in the nation's capital and the name itself being defined in current dictionaries of American English as "usually offensive", "disparaging", "insulting", and "taboo".. 17th century colonists, such as during the Pequot War, used the term to refer to the scalped bodies of Indigenous peoples. In response to the continued controversy, the team owner Dan Snyder sent an open letter to fans that was published in The Washington Post on October 9, 2013. In the letter Snyder states that the most important meaning of the name Redskins is the association that fans have to memories of their personal history with the team. Snyder also states that the name was chosen in 1933 to honor Native Americans in general and the coach and four players at that time who were Native American; and that in 1971 the then coach George Allen consulted with the Red Cloud Athletic Fund on the Pine Ridge reservation when designing the logo. Supporters also assert that a majority of Native Americans themselves are not offended, based upon a public opinion poll in 2004 in which 90% of those who identified as American Indians answered that they were "not bothered" by the name "Redskins" being used for the Washington football team. However, in a commentary published soon after that poll, fifteen Native American scholars collaborated on a critique that stated that there were so many flaws in the Annenberg study that rather than being a measure of Native American opinion, it was an expression of "white privilege" and colonialism. The controversy to this poll was also expressed primarily in 2016 with the twitter hashtag #IAmNativeIWasNotAsked. Additionally, California State University Professor, Dr. James Fenelon, has also created a survey in which 67% of respondents found the team name offensive. This survey focused on Fenelon directly asking individuals with direct involvement and association to Indigenous groups and tribal involvement. Several sportscasters on ESPN opted to refuse to use the word Redskins in television broadcasts, after network stated that they did not have to use the term if they found it offensive. Other sportscasters from alternate networks opted for a similar stance. In May 2016, the Washington Post released a poll of self-identified Native Americans that produced the same results as Annenberg poll, in which 90% of the 504 respondents were "not bothered" by the team's name. Native American groups responded with many of the same criticisms. NCAI Executive Director Jacqueline Pata stated "The survey doesn't recognize the psychological impacts these racist names and imagery have on American Indian and Alaska Natives. It is not respectful to who we are as Native people. This poll still doesn't make it right." In June 2014, the Trademark Trial and Appeal Board (TTAB) voted to cancel the six trademarks held by the team in a two to one decision that held that the term "redskins" is disparaging to a "substantial composite of Native Americans". In a separate case (Matal v. Tam) an Asian-American rock band, "The Slants" appealed the denial of a trademark for their name. In June 2017, the Supreme Court of the United States ruled in favor of Tam, the majority opinion stating "the disparagement clause violates the First Amendment's Free Speech Clause. Contrary to the Government's contention, trademarks are private, not government speech." Both the Native American petitioners and the Justice Department have withdrawn from any further litigation now that the Supreme Court has rendered the legal issue moot, clearing the way for the restoration of the Redskin's trademarks. On December 13, 2017, a Native American activist group known as Rising Hearts created several websites that made it appear that the Redskins had agreed to change its name to the Washington Redhawks. The organizers stated that their intention is to stimulate debate that would eventually lead to an actual name change. They stated that their effort should have been taken as satire, and were surprised that the Redskins issued a statement at all. In response to the possibility that the team could return to the District of Columbia in a new stadium, a coalition of nine civil rights organizations, including the NAACP, issued a statement in August 2018 that such a move should not be made unless the team agrees to drop the Redskins branding, calling it a racial slur. The Cowboys–Redskins rivalry is a sports rivalry between two NFL teams that have won 31 combined division titles and ten Championships, including eight combined Super Bowls. The rivalry started in 1960 when the Cowboys joined the league as an expansion team. During that year they were in separate conferences, but played once during the season. In 1961, Dallas was placed in the same division as the Redskins, and from that point on, they have played each other twice during every regular season. Texas oil tycoon Clint Murchison Jr. was having a difficult time bringing an NFL team to Dallas. In 1958, Murchison heard that George Preston Marshall, owner of the Washington Redskins, was eager to sell the team. Just as the sale was about to be finalized, Marshall called for a change in terms. Murchison was outraged and canceled the whole deal. Around this time, Marshall had a falling out with the Redskin band director, Barnee Breeskin. Breeskin had written the music to the Redskins fight song, now a staple at the stadium. He wanted revenge after the failed negotiations with Marshall. He approached Tom Webb, Murchison's lawyer, and sold the rights for $2,500 (equivalent to $21,200 in 2018). Murchison then decided to create his own team, with the support of NFL expansion committee chairman, George Halas. Halas decided to put the proposition of a Dallas franchise before the NFL owners, which needed to have unanimous approval in order to pass. The only owner against the proposal was George Preston Marshall. However, Marshall found out that Murchison owned the rights to Washington's fight song, so a deal was finally struck. If Marshall showed his approval of the Dallas franchise, Murchison would return the song. The Cowboys were then founded and began playing in 1960. In 2016, the Redskins-Cowboys game on Thanksgiving Day was most-watched regular-season game in Fox history. Sean Taylor's number 21 has not been reissued since his death during the 2007 season, but it is unknown, as of 2018, whether the number should be considered "unofficially retired." A Google search reveals multiple fan petitions seeking to have the number formally retired. Free agent signing O.J. Atogwe, who had "worn No. 21 his entire life", chose to switch to No. 20 out of respect for Taylor. The panel that chose the 70 consisted of former news anchor Bernard Shaw; former player Bobby Mitchell; Senator George Allen (son of coach George Allen); broadcaster Ken Beatrice; Noel Epstein, or for the Washington Post; former diplomat Joseph J. Sisco; Phil Hochberg, who retired in 2001 after 38 years as team stadium announcer; Pro Football Hall of Fame historian Joe Horrigan; sportscaster George Michael; sports director Andy Pollin; NFL Films president Steven Sabol; and news anchor Jim Vance. 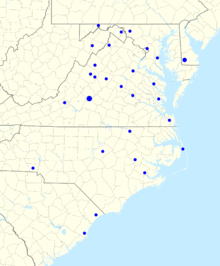 As of 2008[update], the Redskins' flagship station is WTEM (ESPN 980), owned by Urban One as of 2018. Telecasts of preseason games not shown on national networks are aired in HD exclusively on Comcast SportsNet in the overall Mid-Atlantic region. WRC-TV broadcasts preseason games in SD in the Washington, D.C. area. Comcast SportsNet also airs a pregame show and an extensive game recap program after each Redskins regular season Sunday game. Kenny Albert usually does play-by-play, while former Redskins players Joe Theismann and Clinton Portis respectively serve as the color analyst and sideline reporter. In the regular season, most games are shown on Fox NFL. The main exceptions are when the Redskins host an AFC team or play at night. For 17 of the past 19 United States presidential elections, a win for the Redskins' last home game prior to Election Day coincided with the incumbent party winning re-election. The exceptions were in 2004, when Republican incumbent George W. Bush won re-election despite the Green Bay Packers beating the Redskins, and again in 2012, when Democratic incumbent Barack Obama retained the presidency on November 6, despite the Redskins losing to the Carolina Panthers on November 4, 21–13. Other than these exceptions, this "Redskins Rule" has proven true since 1936 when they won and incumbent Franklin D. Roosevelt won re-election, prior to the Redskins' move from Boston in 1937. The rule was discovered in 2000 by Steve Hirdt, former executive vice president of the Elias Sports Bureau, while searching for discussion ideas for a game between the Redskins and Tennessee Titans. ^ "Washington Redskins Front Office". Redskins.com. NFL Enterprises, LLC. Retrieved November 6, 2018. ^ Kring-Schreifels, Jake (December 30, 2015). "Redskins Collect Their 600th Victory In Franchise History". Washington Redskins. Archived from the original on December 31, 2015. Retrieved December 30, 2015. ^ a b c d "Washington Redskins History". CBS Sports. Retrieved July 19, 2016. ^ a b c d e "Washington Redskins Team History". Pro Football Hall of Fame. Retrieved October 2, 2017. ^ "Super Bowl Standings". NFL.com. Retrieved September 28, 2014. ^ Badenhausen, Kurt. "Full List: The World's 50 Most Valuable Sports Teams Of 2018". Forbes. ^ "Official 2015 National Football League Record and Fact Book" (PDF). NFL.com. p. 542. ^ "History By Decades". Washington Redskins. Archived from the original on March 22, 2011. Retrieved August 21, 2017. ^ Richman, Michael (2008).The Redskins Encyclopedia, 3, Temple University Press, Philadelphia. ^ a b c "Washington Redskins History: 1930". Washington Redskins. Archived from the original on February 17, 2009. Retrieved December 13, 2009. ^ a b c d e f g h i j k l m n o p q r s t "Washington Redskins playoff history". ESPN. Archived from the original on January 16, 2008. Retrieved April 5, 2008. ^ "Turk Edwards Hall of Fame biography". Pro Football Hall of Fame. Retrieved April 7, 2008. ^ "NFL History: 1943". National Football League. Retrieved April 6, 2008. ^ "No. 33". Time. December 22, 1952. Retrieved April 7, 2008. ^ a b c d e f g h i j k l m n o p q "Washington Redskins' History". CBS Sports. Retrieved December 13, 2009. ^ a b c "Washington Redskins History: 1950". Washington Redskins. Archived from the original on February 17, 2009. Retrieved December 13, 2009. ^ "NFL Coach of the Year Award". Hickok Sports. Archived from the original on December 5, 2012. Retrieved April 6, 2008. ^ a b "Washington Redskins History: 1960". Washington Redskins. Archived from the original on February 17, 2009. Retrieved December 13, 2009. ^ a b "A Look At The Four Redskins Owners". Washingtonian. Retrieved April 5, 2008. ^ "Lecture: Lynn Povich and George Solomon". New York University. Archived from the original on June 23, 2008. Retrieved April 5, 2008. ^ a b c d e f "Civil Rights on the Gridiron". ESPN. Retrieved April 5, 2008. ^ "August 1962 Scoreboard". Time. August 10, 1962. Retrieved April 6, 2008. ^ a b c d "Washington Redskins History: 1970". Washington Redskins. Archived from the original on February 17, 2009. Retrieved December 13, 2009. ^ "His past molds Bucs' future". St. Petersburg Times. Archived from the original on January 3, 2009. Retrieved April 5, 2008. ^ a b c d e f g h i j "Washington Redskins History: 1980". Washington Redskins. Archived from the original on February 17, 2009. Retrieved December 13, 2009. ^ Steinberg, Dan. "Redskins fans are back to chanting 'We Want Dallas'". Washington Post. Retrieved May 17, 2018. ^ a b c d e f g h i j k l m n o "Washington Redskins History: 1990". Washington Redskins. Archived from the original on February 17, 2009. Retrieved December 13, 2009. ^ a b c d e f g h i j k l m n o p "Washington Redskins History: 2000". Washington Redskins. Archived from the original on February 17, 2009. Retrieved December 13, 2009. ^ "DC Sports Bog". The Washington Post. ^ a b c d "2005 Washington Redskins". Football @ JT-SW. Retrieved April 8, 2008. ^ a b "2006 Washington Redskins". Football @ JT-SW. Retrieved April 8, 2008. ^ Maske, Mark (December 22, 2013). "Pierre Garçon breaks Art Monk's Redskins record for catches in a season". Washington Post. Retrieved February 12, 2014. ^ Jones, Mike. "Jim Haslett out as Redskins defensive coordinator". Washington Post. Retrieved January 7, 2015. ^ Orr, Conor. "Washington Redskins make Scot McCloughan GM". NFL.com. Retrieved January 7, 2015. ^ Clarke, Liz. "Kirk Cousins powers Redskins' rally from down 24 to beat Bucs, 31–30". Washington Post. Retrieved October 25, 2015. ^ Ortega, Mark. "Redskins clinch NFC East with win over Eagles". NFL.com. Retrieved December 27, 2015. ^ McMillan, Keith. "Packers at Redskins game day: Green Bay ends Washington's season, 35–18". Washington Post. Retrieved January 11, 2016. ^ a b c Lewis Jr, Lake. "2016 Redskins offense rewrote franchise record books". USA Today. Retrieved January 6, 2017. ^ Reyes, Lorenzo. "Giants knock Redskins out of playoff contention". USA Today. Retrieved January 6, 2017. ^ "First back-to-back winning record for Redskins since 1997". csnmidatlantic.com. Retrieved January 6, 2017. ^ Wilson, Ryan. "Redskins fire four coaches, including defensive coordinator Joe Barry". CBS Sports. Retrieved January 6, 2017. ^ "Washington Redskins Team Capsule" (PDF). 2018 Official National Football League Record and Fact Book. NFL Enterprises, LLC. August 9, 2018. Retrieved November 21, 2018. ^ Evolution of the Redskins colors. NFL Enterprises, LLC. October 3, 2012. ^ "Redskins Adopt 'Retro' Look; 70 Greatest Redskins to be Selected" (Press release). Washington Redskins. February 6, 2002. Archived from the original on October 13, 2002. Retrieved July 23, 2016. ^ "Washington Redskins New Uniforms". ESPN. Retrieved August 27, 2010. ^ "Roethlisberger leaves at halftime, Leftwich leads Steelers past Skins". ESPN.com. ESPN Internet Ventures, LLC. November 3, 2008. Retrieved November 22, 2018. ^ Fitzgerald, Gary (September 12, 2010). "Redskins Go For Gold (Pants) In Season Opener". Washington Redskins. Archived from the original on August 9, 2016. Retrieved June 21, 2016. Guard Derrick Dockery was the first to walk out on the field wearing gold pants. The pants had burgundy and white stripes down the sides. The outfit included burgundy and white striped socks as well. ^ Steinberg, Dan (September 12, 2010). "Redskins wearing gold pants". The Washington Post. Retrieved June 21, 2016. ^ Sessler, Marc (October 31, 2012). "Washington Redskins' alternate unis revealed". National Football League. Retrieved June 21, 2016. ^ Tinsman, Brian (May 10, 2012). "Redskins Unveil 80th Anniversary Uniforms". Washington Redskins. Archived from the original on August 9, 2016. Retrieved June 21, 2016. ^ Chase, Chris. "New NFL rule ruins Redskins' iconic throwback uniforms". USA Today. Retrieved March 2, 2014. ^ Steinberg, Dan. "Redskins removing burgundy collars from white jerseys". Washington Post. Retrieved March 2, 2014. ^ Tesfatsion, Master. "Redskins players, and fans, hope the burgundy pants are here to stay". Washington Post. Retrieved October 23, 2016. ^ "definition of redskin". RANDOM HOUSE KERNERMAN WEBSTER'S College Dictionary. Archived from the original on October 6, 2014. Retrieved November 7, 2014. ^ Dunbar-Ortiz, Roxanne. An Indigenous Peoples' History of the United States. Boston: Beacon Press, 2014. ^ J Gordon Hylton (January 1, 2010). "BEFORE THE REDSKINS WERE THE REDSKINS: THE USE OF NATIVE AMERICAN TEAM NAMES IN THE FORMATIVE ERA OF AMERICAN SPORTS, 1857–1933". 86. North Dakota law review: 879. ^ Hill, Michael. “Indian Opponent of Redskins Name Meeting with NFL.” Navajo Times , 31 Oct. 2013, p. 8. ^ D. Anthony Tyeeme Clark (2005). "Indigenous Voice and Vision as Commodity in a Mass-Consumption Society: The Colonial Politics of Public Opinion Polling". American Indian Quarterly. University of Nebraska Press. 29 (1/2 (Winter – Spring)): 228–238. doi:10.1353/aiq.2005.0039. JSTOR 4138809. ^ Indian Country Today. “67 Percent of Native Americans Say 'Redskins' Is Offensive.” IndianCountryToday.com, Indian Country Today, 4 June 2014. ^ John Breech (August 23, 2014). "ESPN updates its policy regarding use of Redskins team name". CBS Sports. ^ The Associated Press. "Two influential TV announcers say they won't use 'Redskins' name on NFL telecasts". ABC 7 - Washington DC. ^ Cox, John Woodrow (May 19, 2016). "New poll finds 9 in 10 Native Americans aren't offended by Redskins name". Washington Post. Retrieved May 19, 2016. ^ Alex Johnson (April 25, 2016). "Supreme Court Asked to Hear Two Cases That Could Sack Washington 'Redskins' Name". NBC News. ^ "15-1293 Martal V. Tam" (PDF). Retrieved June 19, 2017. ^ "Leading National Civil Rights and Racial Justice Organizations Announce Joint Opposition to Washington NFL Team Locating New Stadium in District of Columbia". NAACP. August 24, 2018. ^ "NFL History 1951–1960". National Football League. Retrieved April 7, 2008. ^ a b c d "A rivalry for a song ... and chicken feed". ESPN. Retrieved April 7, 2008. ^ Mike Coppinger (November 25, 2016). "Cowboys-Redskins was most-watched regular-season game in Fox history". USA Today. Retrieved February 3, 2017. ^ "'Deeply Hurt,' Mitchell Retires; Redskins Great Felt Slighted by Team". Washington Post. Archived from the original on November 5, 2012. ^ "Redskins Ring of Fame". Archived from the original on January 16, 2010. Retrieved October 23, 2009. ^ "Mitchell to Be Inducted into Ring of Fame". Archived from the original on October 24, 2009. Retrieved October 23, 2009. ^ Tinsman, Brian (August 24, 2012). "Ten Newest Greatest Redskins Announced". Redskins.com. Archived from the original on August 25, 2012. Retrieved August 24, 2012. ^ a b c d e f "Team-by-team single-season records – Names and Numbers". Football Digest. 2002. Archived from the original on September 25, 2004. Retrieved January 12, 2008. ^ "Moss, Portis Set New Franchise Marks". Washington Redskins Website. Archived from the original on March 24, 2006. Retrieved December 29, 2007. ^ a b c d "Washington Redskins: Firsts, Records, Odds & Ends". Pro Football Hall of Fame. Retrieved April 5, 2008. ^ a b "Helu, Gano Set New Franchise Marks". redskins.com. 2011. Archived from the original on November 9, 2011. Retrieved November 7, 2011. ^ "Larry Michael: D.C.'s most versatile voice". GW Hatchet. Archived from the original on May 29, 2008. Retrieved December 27, 2007. ^ "Redskins.com – Radio Network". Archived from the original on April 10, 2018. Retrieved December 13, 2018. ^ Mooney, Alexander (November 4, 2008). "McCain gets bad sign?". CNN. Retrieved November 5, 2015. ^ White, Joseph (November 4, 2012). "Panthers Beat Redskins 21–13: Cam Newton Outplays RG3, Carolina Breaks 5-Game Skid". Huffington Post. Associated Press. Retrieved November 5, 2015. ^ Hofheimer, Bill (October 30, 2012). "'Redskins Rule': MNF's Hirdt on intersection of football & politics". ESPN. Retrieved November 5, 2015. Cronin, Brian. "Were the Washington Redskins once the Duluth Eskimos?" Los Angeles Times, March 15, 2011. Richman, Michael. The Redskins Encyclopedia. Philadelphia: Temple University Press, 2009. Smith, Thomas G. Showdown: JFK and the Integration of the Washington Redskins. Boston: Beacon Press, 2011.